Judges evaluated more than 1,400 entries and selected 269 national winners in the 2017 Yearbook Excellence Contest. The professionals who served as judges commended the heightened creativity of the winners. The judges also commented on the fine reporting, in-depth captions and strong visual packages of the winning entries. In addition, theme development winners received compliments for their unique designs and diligent work in producing creative yearbooks. Yearbook staff members recognized in this year’s contest received Gold Keys and the opportunity to apply for college journalism scholarships. For a complete list of winners, see below. 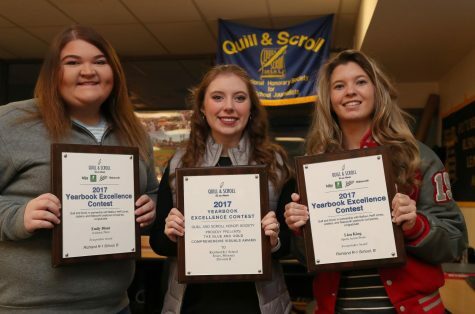 Sweepstakes winners will receive plaques from Quill and Scroll. The 2017 contest had two enrollment divisions (A = 750 students or more; B = 749 students or fewer) and 18 subject categories, making for 36 Sweepstakes winners. The following schools earned Blue and Gold Awards based on their staffs’ overall performance in the Yearbook Excellence Contest. National Winners are recognized in each category for work done that exemplifies the quality and values that Quill and Scroll stands for. Here are the National Winners for the 2017 Yearbook Excellence Contest. Contributors to National Winners and Sweepstakes Winners are noted with a (C).